Welcome to part three of my “I can’t believe I finished the TAST 100 stitch embroidery challenge” catch up series. I accidentally published two posts yesterday (oops), but never mind, I have a feeling there will be a lot more embroidery going on around here to tell you about! Braid stitch wasn’t a TAST stitch as far as I can remember. I tried it with a few different threads and I’m really not a fan. I just couldn’t get it to look nice, no matter what I did. Once again, I tried this stitch in an assortment of threads. It didn’t work well in wool because of the crimp or bounciness of the thread. Cotton lays nice and flat, however and looks pretty good. I’d reserve this for graphic elements worked in straight lines. Ever shortening rows stacked on top of each other for a roof, for example, or perhaps a single row for a window box. 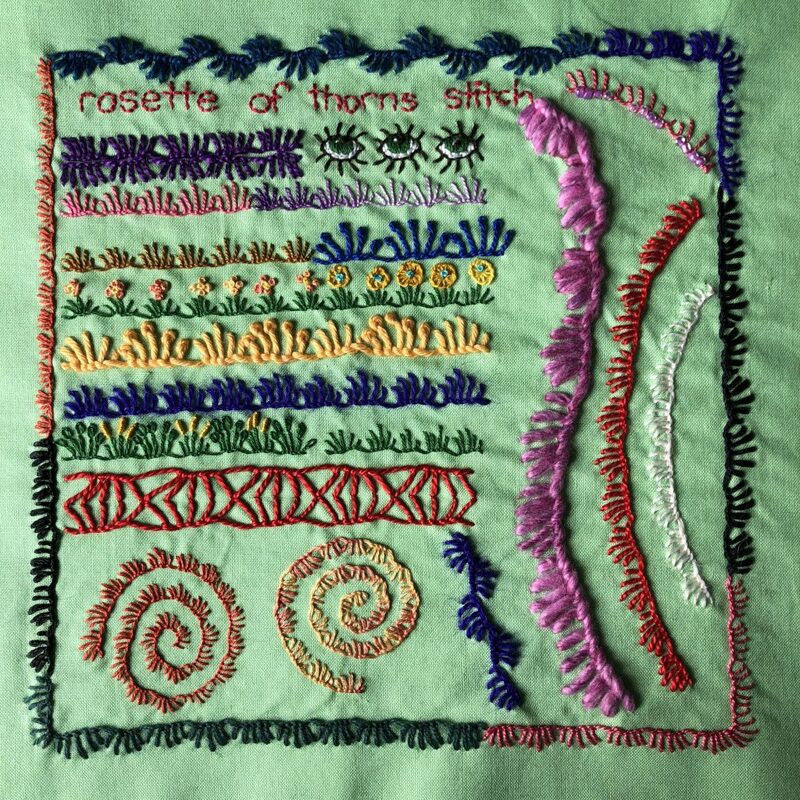 Rosette of thorns is another non-TAST stitch. I had to try it because I love pretty much all variations of blanket stitch. I tried lots of different threads, from my finest perle cotton to thick knitting wool/silk mix. I love how useful this stitch is. It makes great grass and flower stems, eyelashes and geometric borders. It also works well in straight lines, spirals and curves. I think my favourite, however, is the top of the border where I alternated which side of the line the stitches were formed. Worked vertically in green it would make an amazing fern-like plant. 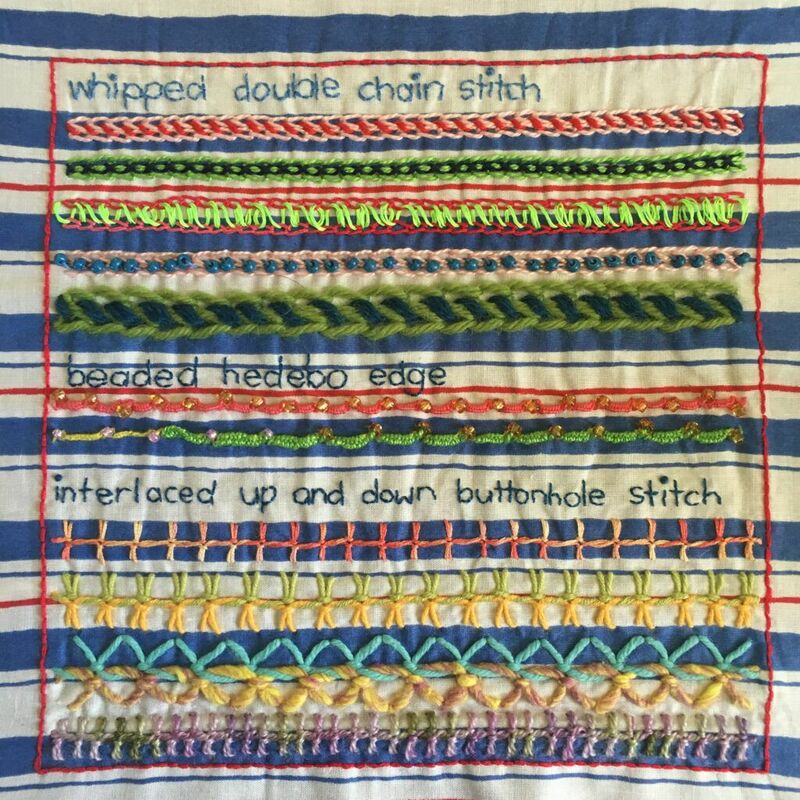 Stitch 80 revisited: Double whipped chain stitch. 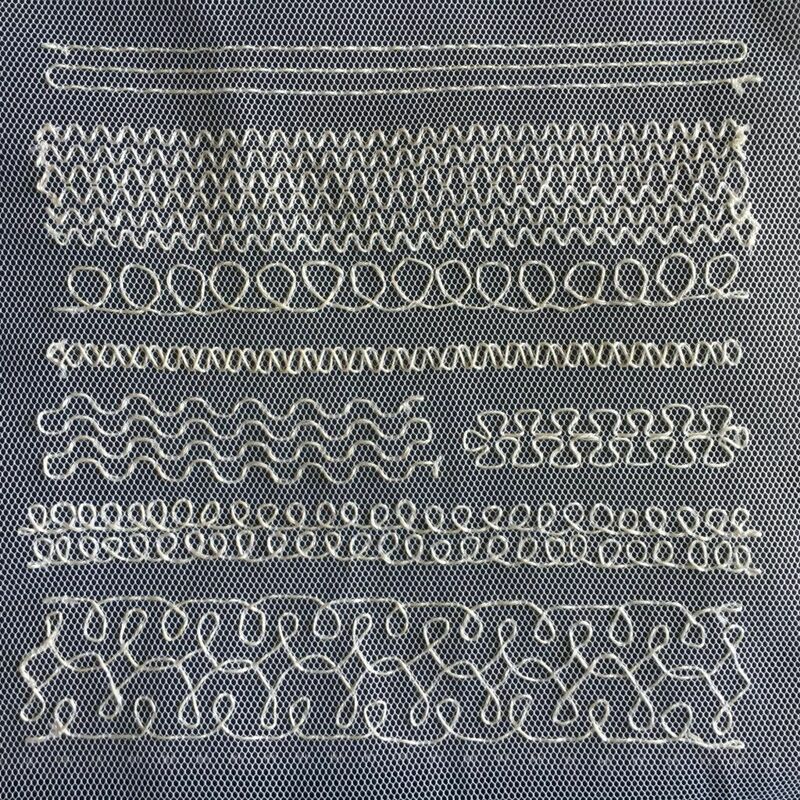 I worked a few different lines of whipped double (or double whipped) chain stitch back when it was first announced, but I had a lot more variations and threads to try out. When I came across this great fabric in my stash, I knew they’d go perfectly together. I tried just about every thread I have in both wools and cotton, whipped triple rows, spaced rows apart, whipped the centres and the edges and whipped in both directions to make cross stitches up the centre. This would be a tricky stitch to work in circles, but it’s a great one for border treatments and seams. 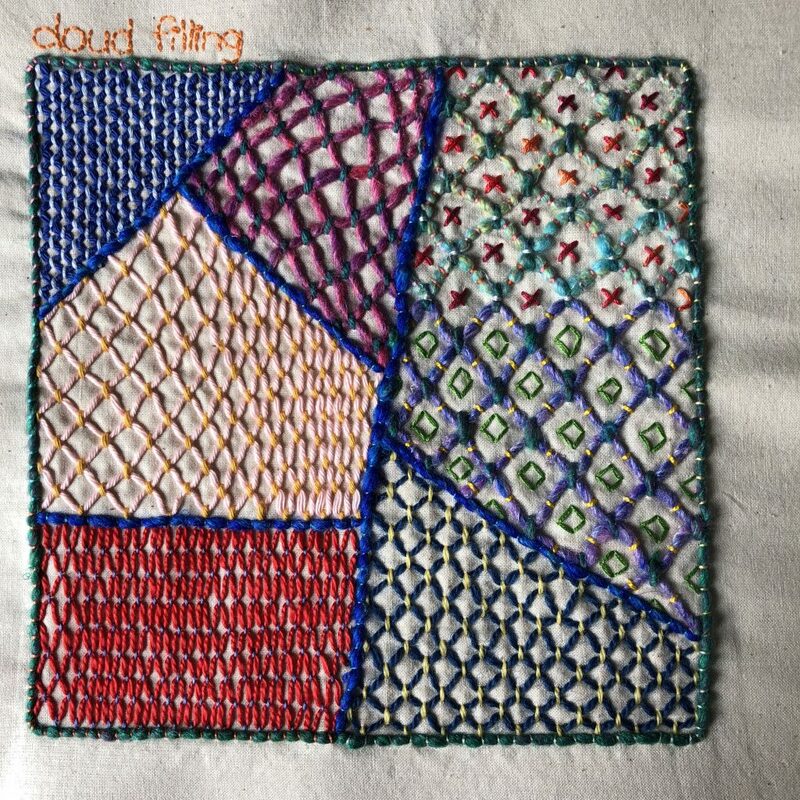 Stitch 38: Revisiting cloud filling stitch. I recorded cloud filling back in August 2016 but didn’t experiment with it at all. 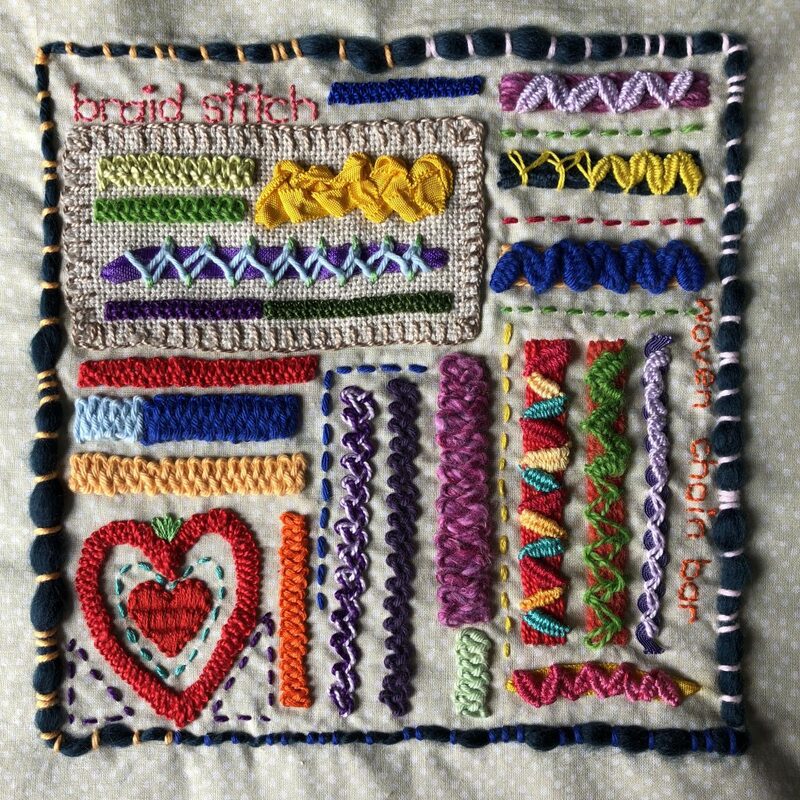 In this sampler, I tried lots of different ways of spacing the ground stitches the yarn is woven through, as well as lots of different yarns. In the pale pink area I started more spread out on the left and gradually made the vertical rows of stitches closer together, which gives a lovely sense of movement and perspective. I then used cloud stitch to embroider most of this little picture. I’m particularly fond of the beaded section in the sun. After working the cloud stitch, I stitched a gold bead into each diamond shape. Well that’s it for part three of my five part TAST catch up. See you tomorrow for more! 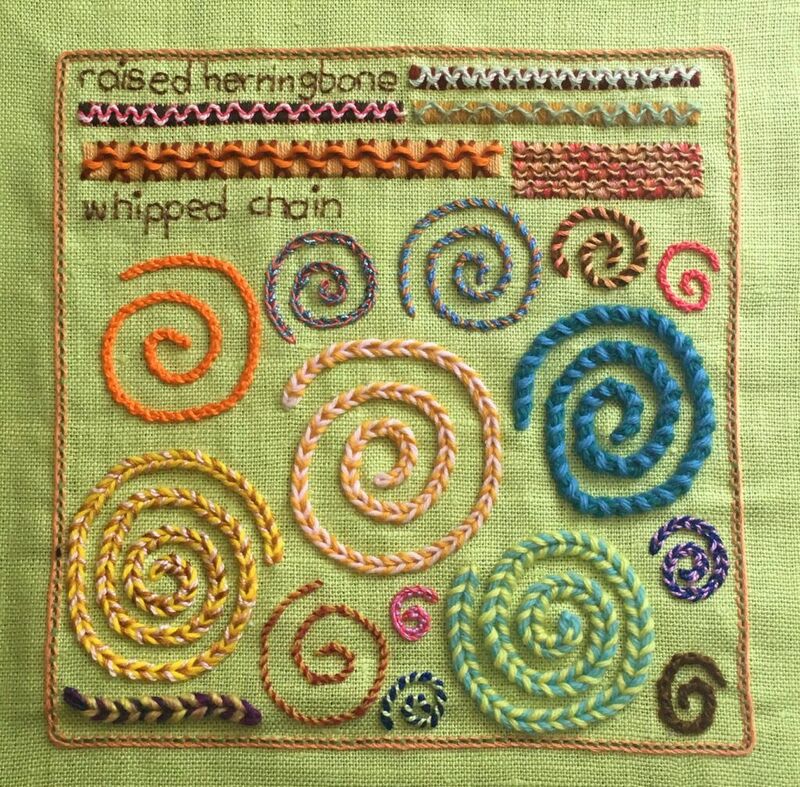 For my triple chain stitch sampler I used a range of cottons and wools on quilting cotton. Triple chain is a very graphic stitch so I used it to embroider some 1960’s mod style flowers on appliquéd wool felt. Changing the angle of the stitches that stick out either side can change the look quite dramatically. My favourite is the green “bamboo” worked in variegated green floss. 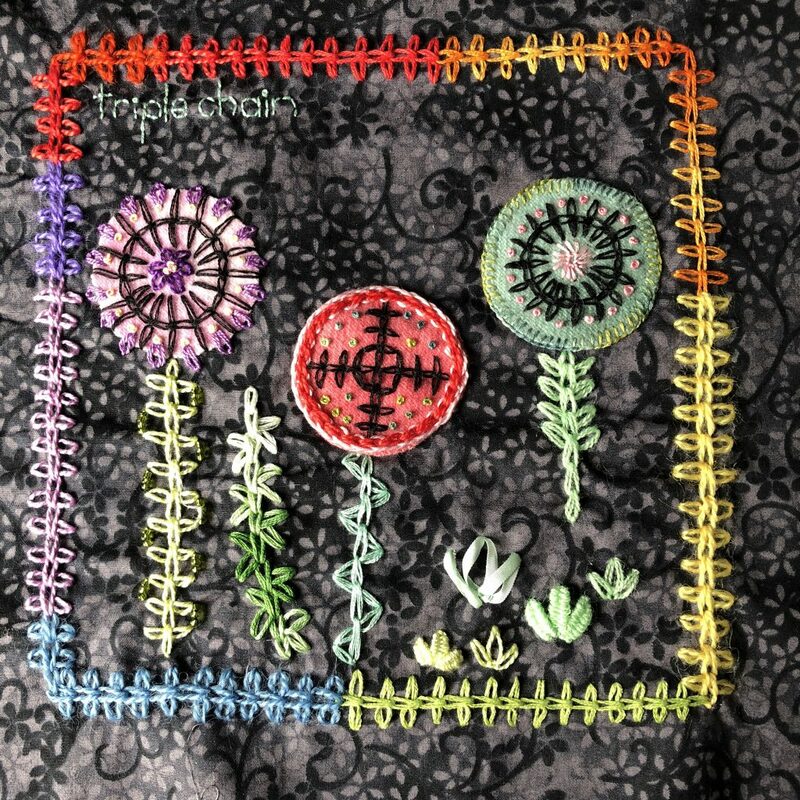 I also wove some little grass bits with just one repeat of triple chain. My final assessment of triple chain stitch is that it’s great for dramatic looking borders, graphic flowers and stalks of bamboo. I didn’t do much with it, the first time I worked triangular feather stitch, so I decided to try it again. I chose to experiment with border treatments, layering and working circles. For the border treatments I worked the stitch on alternating sides and tried different ways of combining two rows while also changing the lengths of the feathered part of the stitch. I quickly realised that this is one of those “chameleon” stitches that looks great no matter what you do with it. 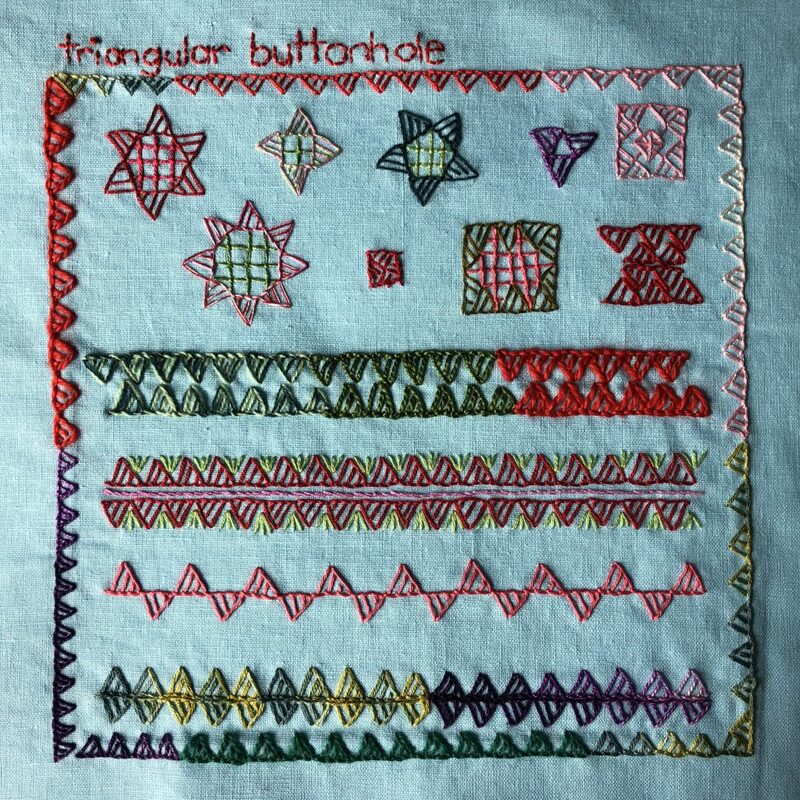 Triangular buttonhole is another stitch I didn’t explore much the first time I worked it, only having added beads. This time I sketched out some motifs to try, and different ways to combine rows to make border treatments. I also worked a row with the triangles on alternate sides. I really like all of these experiments but I think the row with triangles alternating on the top and bottom is my favourite. 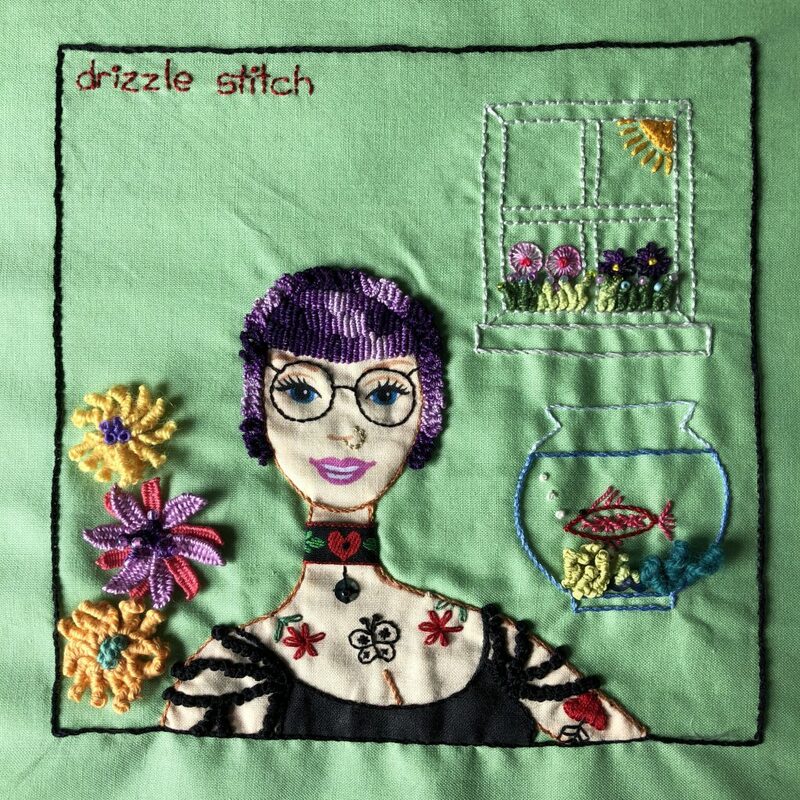 Drizzle stitch is one of those “helper” stitches that really don’t work well on their own. I struggled a bit with deciding what to do with it, but then I found a scrap of Barbie doll fabric in my stash and this idea was born. Barbie just isn’t my thing, plus the top of her head was missing so I gave her a makeover. 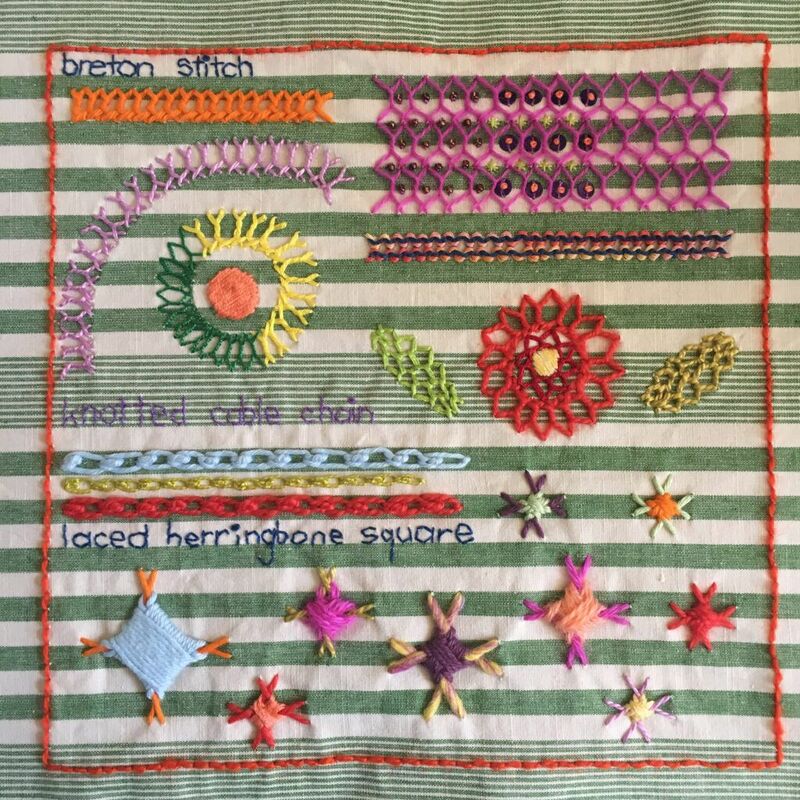 In this sampler the drizzle stitch is worked as the foliage for the flowers in the window box, the outer layer of Barbie’s hair (her fringe is bullion stitch), the seaweed in the fish bowl, the petals of the top and bottom flowers and the centre of the middle flower. I added a bead to some of the drizzle stitches. I think it worked great for all these purposes and might use it in the future if I work something really textural. Well that’s it for part two of my five part TAST catch up! Check back tomorrow for part three. Whilst rummaging through my boxes full of TAST (Take a Stitch Tuesday) embroidery samplers, I realised I had over 20 that I hadn’t shown you yet. So this is the first in a series of five posts showing everything you haven’t seen. (BTW, TAST has started afresh for 2018 so if you’d like to join in, visit the TAST FaceBook group for details). These are in the order I embroidered them (sort of). Or at least the order I grabbed them out of the box when I ironed them. Click the photos to make them larger if you’d like to view details up close. Here goes! I didn’t really give raised chain v1 & raised chain v2 much of a chance when I first embroidered them so I went back and had another go. This time I tried threads from the thinnest (a fine cotton) to the thickest (worsted weight knitting wool). 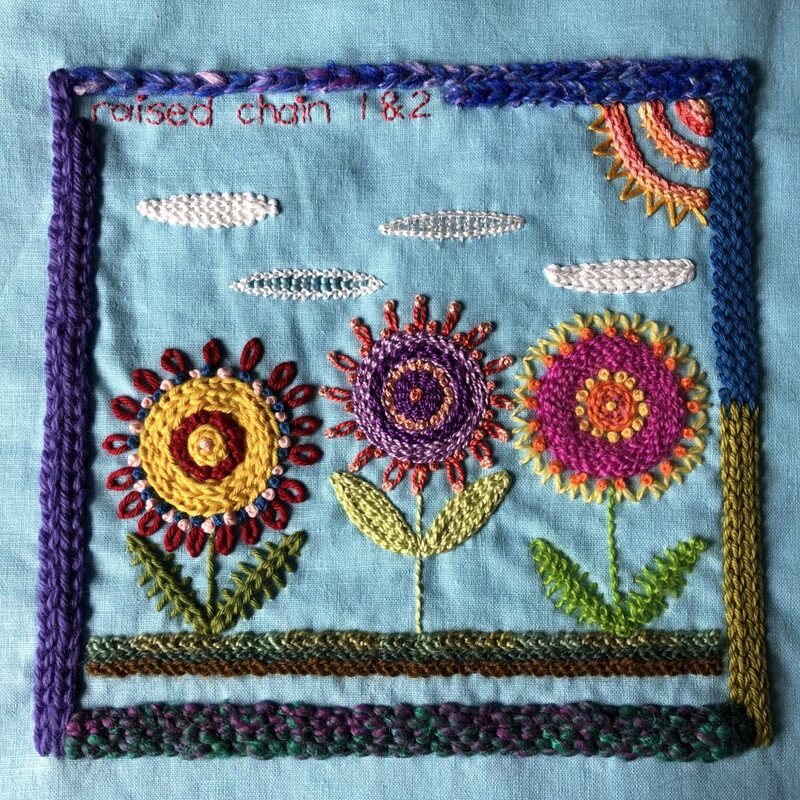 I stitched rings (the flower centres are filled with other stitches), leaves and clouds and even added beads to the ladder stitches with raised chain either side. 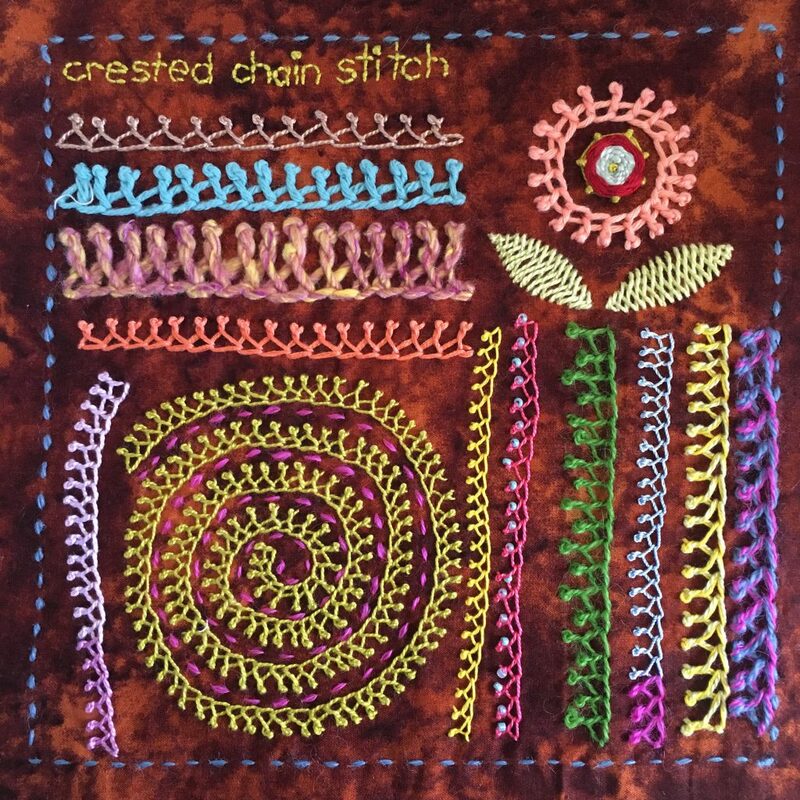 My conclusions after working raised chain 1 & 2 is that they make great ring shapes, look fabulous in just about any thread and are wonderful stitches for borders and “grounds” in garden scenes. 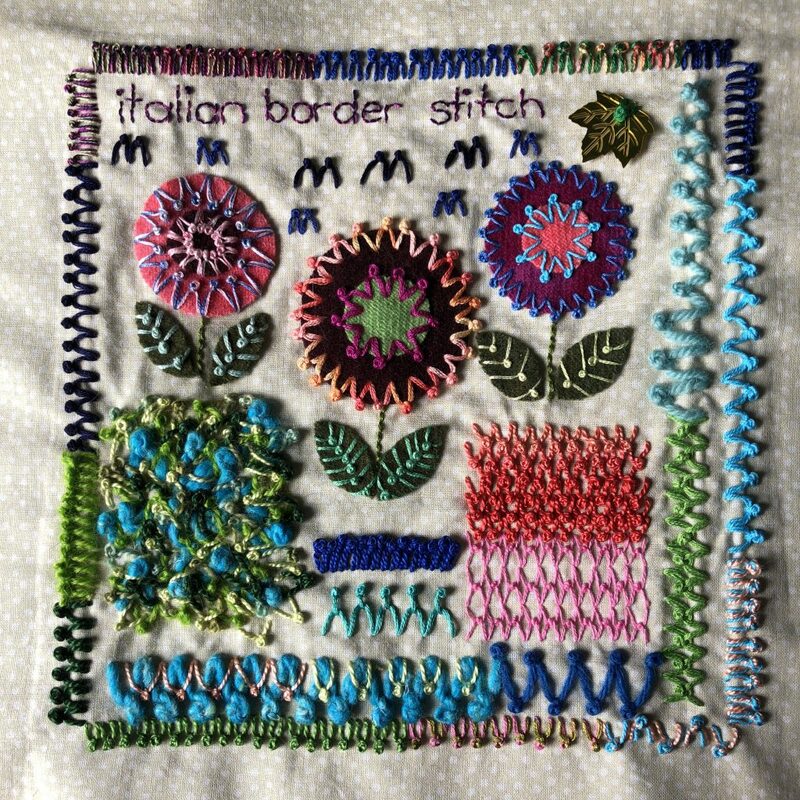 Next up was Italian border stitch, which I don’t think was an official TAST stitch for the 2015-2017 TAST challenge. Again, I tried lots of different threads. I even used it to stitch down a giant leaf sequin. I think my favourite uses for this stitch weren’t the borders at all. I really love it for making circles and leaves. Next are a bunch of stitches that definitely weren’t TAST stitches but after completing all 100, these were stitches I wanted to record for future use. 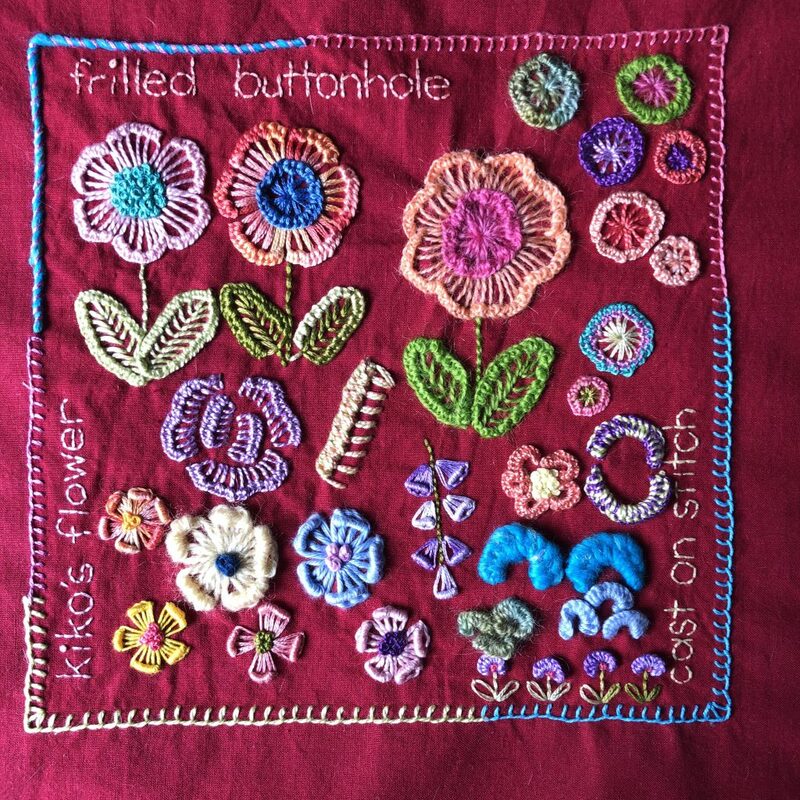 Frilled buttonhole stitch (from Let’s Learn Embroidery), Kiko’s flower stitch and cast on stitch. As usual, I tried lots of different threads. I found Kiko’s flower a bit tricky when it came to getting the bullion stitch to sit nicely. It’s a very pretty stitch but one I’d use sparingly. I like the purple blue-bell looking flowers the most. Frilled buttonhole is a definite favourite though, as is cast on stitch. Next up are more “not TAST’ stitches. Shisha stitch and Gujrati stitch on a medium weight wool. I used a few different methods for working shisha stitch. 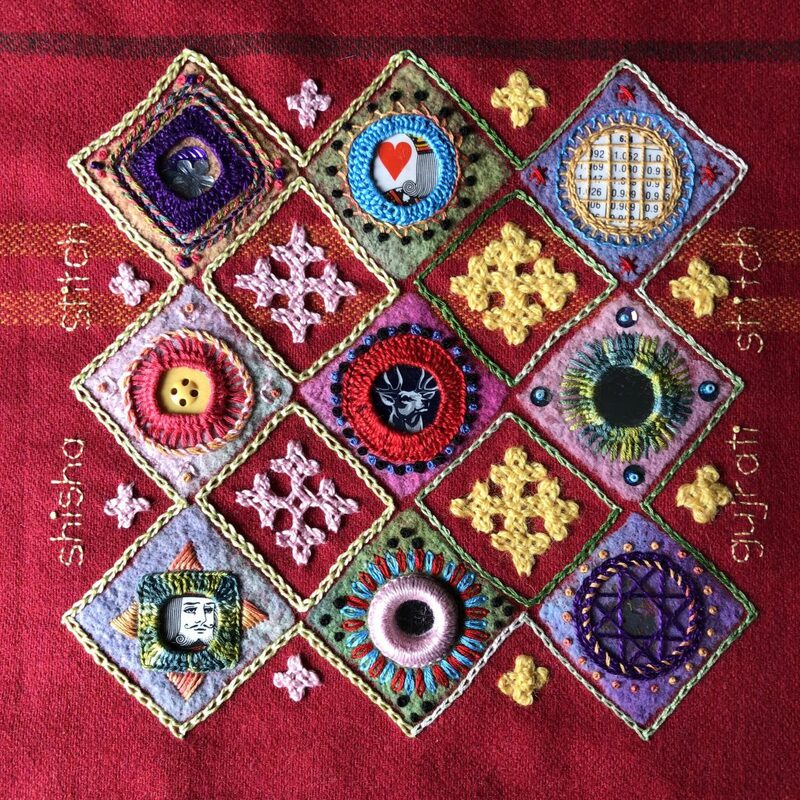 A google search will reveal many different tutorials but if you like working from books, I highly recommend “Shisha Mirror Embroidery, a Contemporary Approach” by Jean Simpson. It contains no less than 10 different ways to work shisha embroidery and has an amazing collection of motifs that include mirror work. bottom row: laminated playing card, mirror, old sequin. I worked the Gujrati stitch in cotton on the left half and wool on the right. These are two of my favourite stitches that I’m definitely going to use a lot more in the future. 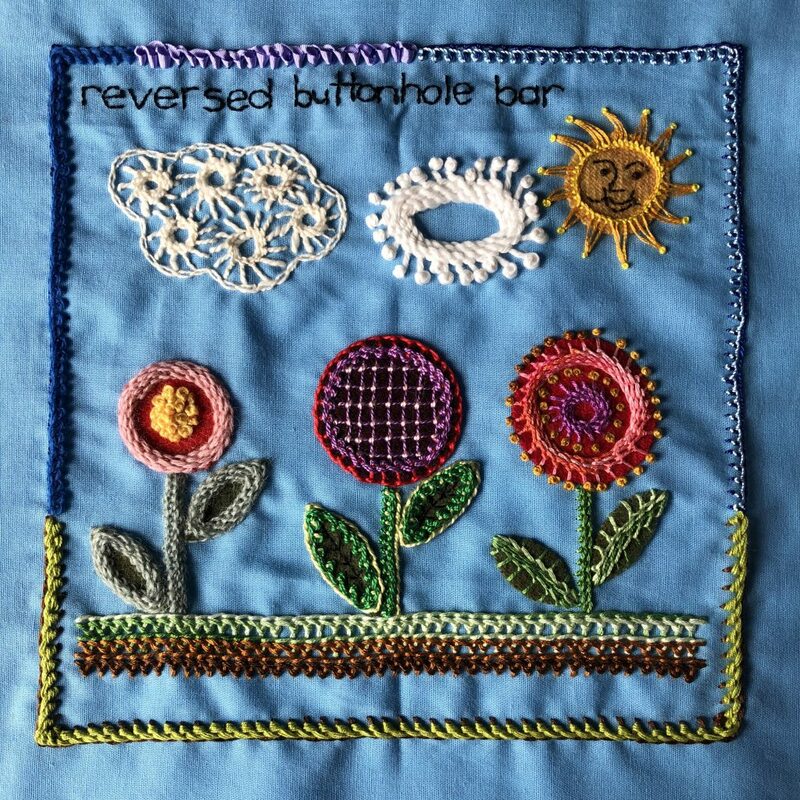 Next up, TAST 2015-2017 stitch number 96 was reversed buttonhole bar. I worked single rows on on the buttonhole (or blanket stitch) foundation, all the way up to filling it completely. This is another stitch that makes really great rings, borders and grounds. I’m especially fond of my little sun and the left hand cloud, which is worked in some of my very first handspun cotton. Well that’s it for the first TAST catch up post! I’ll be posting one a day for the next 4 days, then showing off a recently finished project and the first month of embroidery for “Beyond TAST” 2018 so look out for a whole week of stitchy goodness. TAST Catchup Part 2 and More! 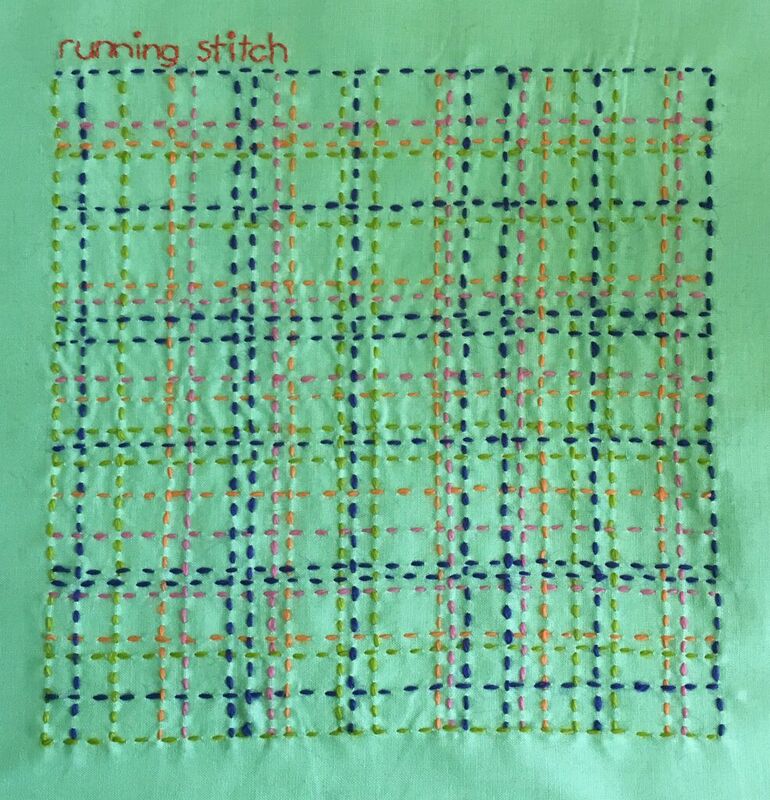 All of my TAST and stitch samplers are 20 by 20 cm or 8 by 8 inches square, and are worked on upcycled fabric (either other people’s discarded fabric from the op shop/thrift store, or old pieces of textile). I also use 99.9% thrifted threads discarded by other stitchers. I have included a tiny amount of handspun cotton and a thread or two I’ve been given for my birthdays over the years. Wrapped coral stitch worked in just about every kind of thread I have. I worked the stitches super close together, a bit further apart, with beads and without. I like them best close together and with beads that are a similar size to the wrapped knots. Smooth threads look the nicest but the wool still looks good. Linked double chain also looks good in all sorts of threads. I tried it in lines, and as a textured surface with overlapping seaweedy frondy things. I quite like the three pronged effect on the top of the lines. 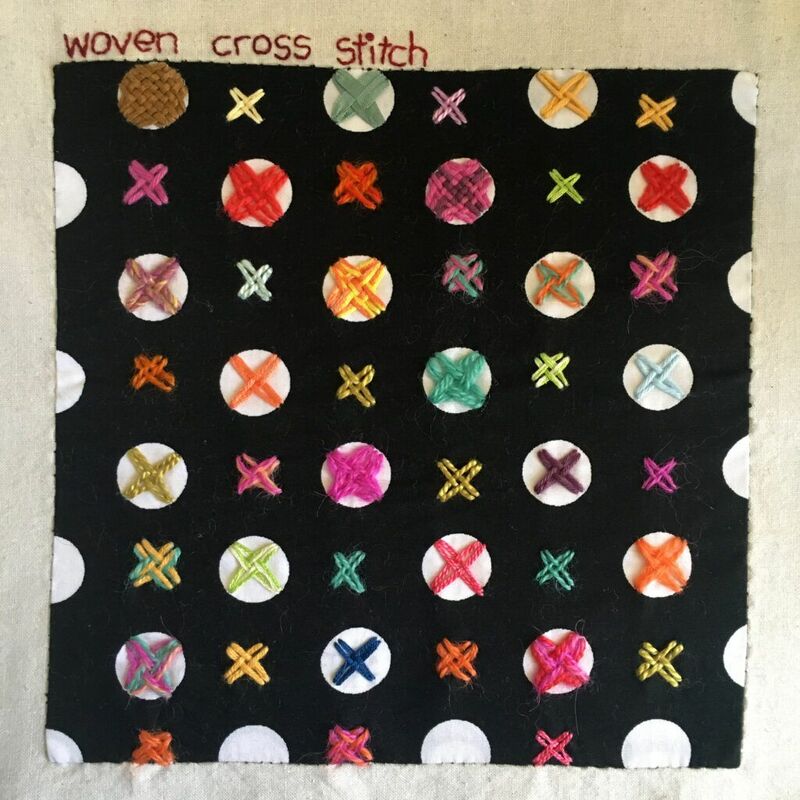 Woven cross stitch. I love to work on fabric with big polka dots and had been waiting for a chance to use this great white on black fabric that I found at the op shop. Woven cross stitch was a perfect choice of stitch. This time, instead of just trying different threads, I also tried two colours and sometimes two different threads stranded together. 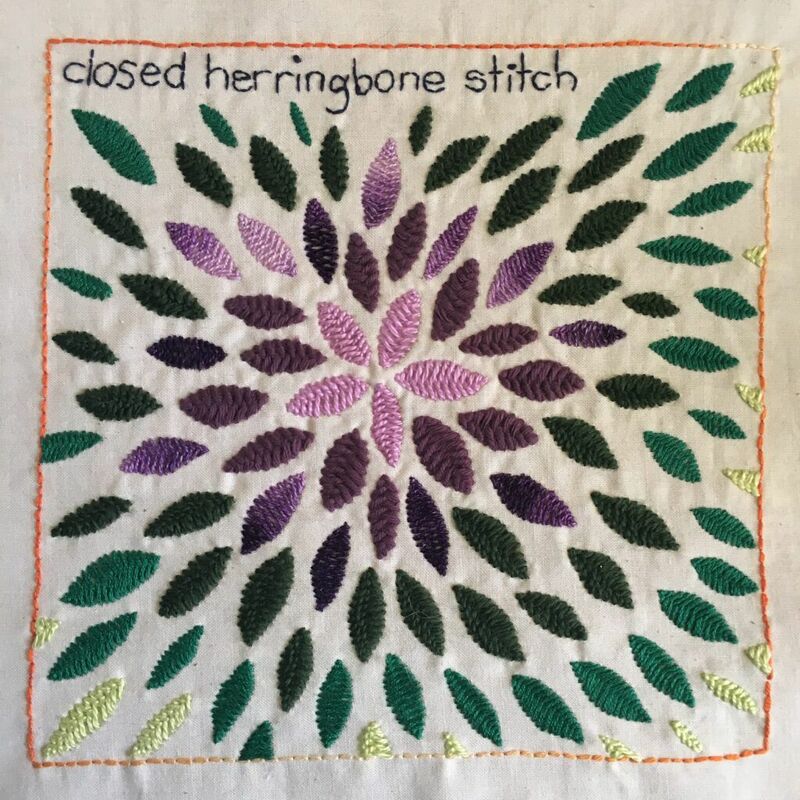 Some of them also have a lot more than two cross stitches interwoven, a favourite being the one with two shades of purple. I worked a regular woven cross stitch in dark purple, then added the lighter purple on either side. 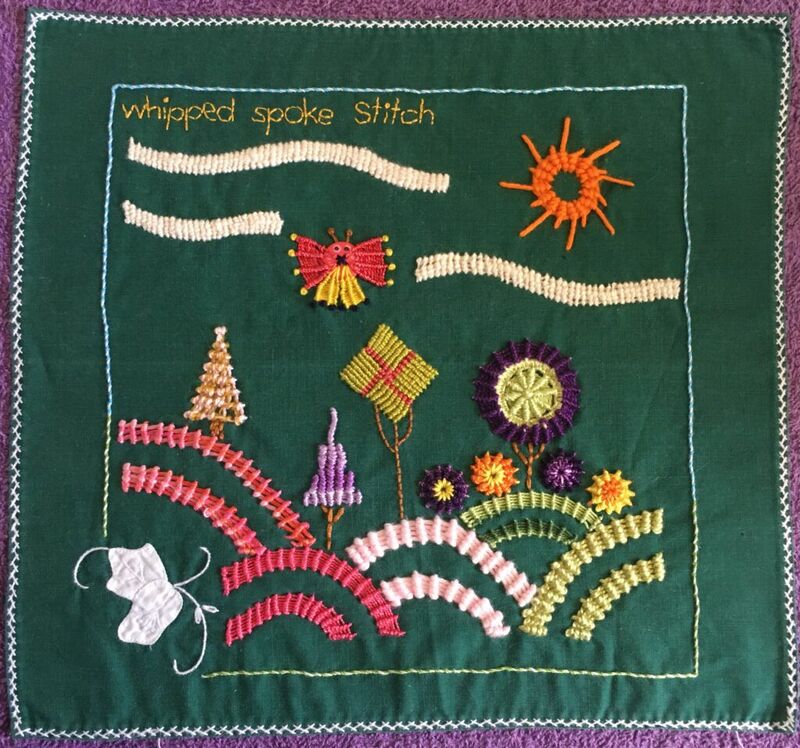 Whipped spoke stitch is an enormous amount of fun! This sampler is embroidered on a vintage serviette. 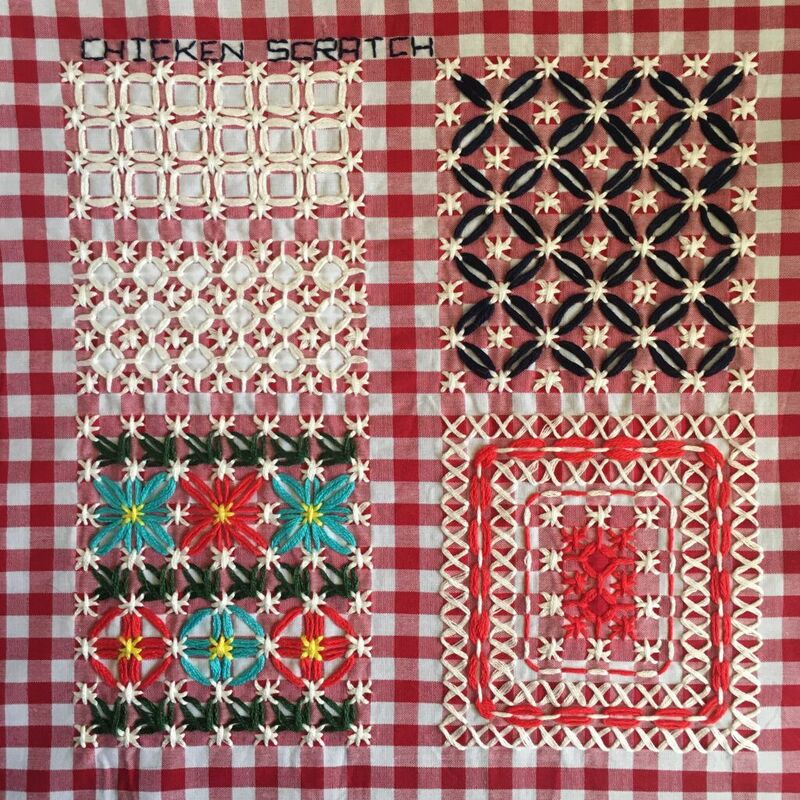 This sampler is worked in cotton, from handspun to perle and everything in between. Whipped stitches don’t seem work very well with threads like crewel wool because of the curl of the fibre. This sampler is probably going to determine the size of my finished fabric books because I really want to keep the great edge of the original serviette. I don’t use even weave fabrics often because I really like a freestyle approach to embroidery but the more I use them, the more I like them. I worked sorbello stitch in everything from Medici wool, which is very thin, to bulky hand knitting wool/silk. I found that it’s a really nice stitch to work in bands, but really shines when it’s used as a filling. I especially love the variegated wool/mohair in purples and greens. I love flowers, so of course I had to turn woven trellis stitch into a bed of flowers. Because it’s a woven, rather than wrapped stitch it works well with wool or cotton. 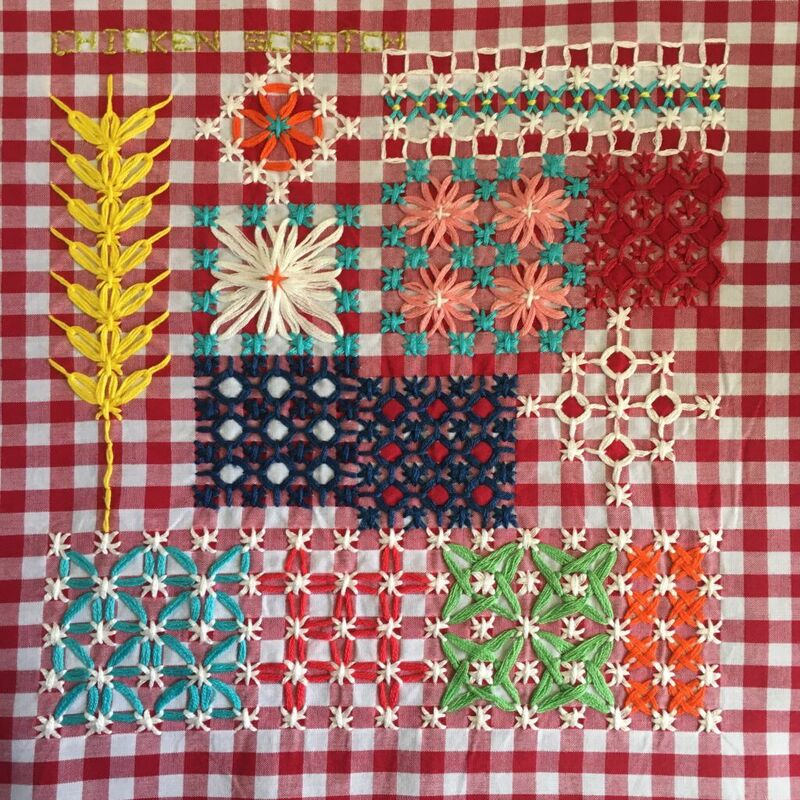 Next is another multi stitch sampler. 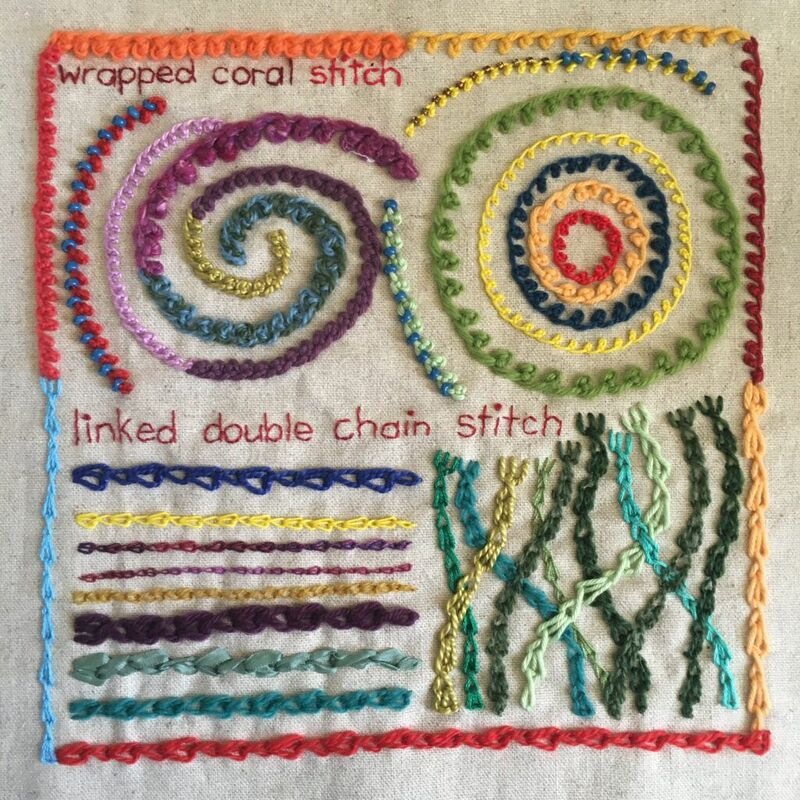 I only worked a few lines of whipped double chain because I have worked quite a bit of it on my chain stitch sampler in week 8. I love this stitch so I may go back and work a whole page. I worked just a few lines of interlaced up and down buttonhole stitch even though I like it because I just wanted to record the interlacement. I’ve investigated up and down buttonhole quite a bit in previous samplers as it’s a stitch I really like, so just wanted to record the way the two lines are woven together this time. 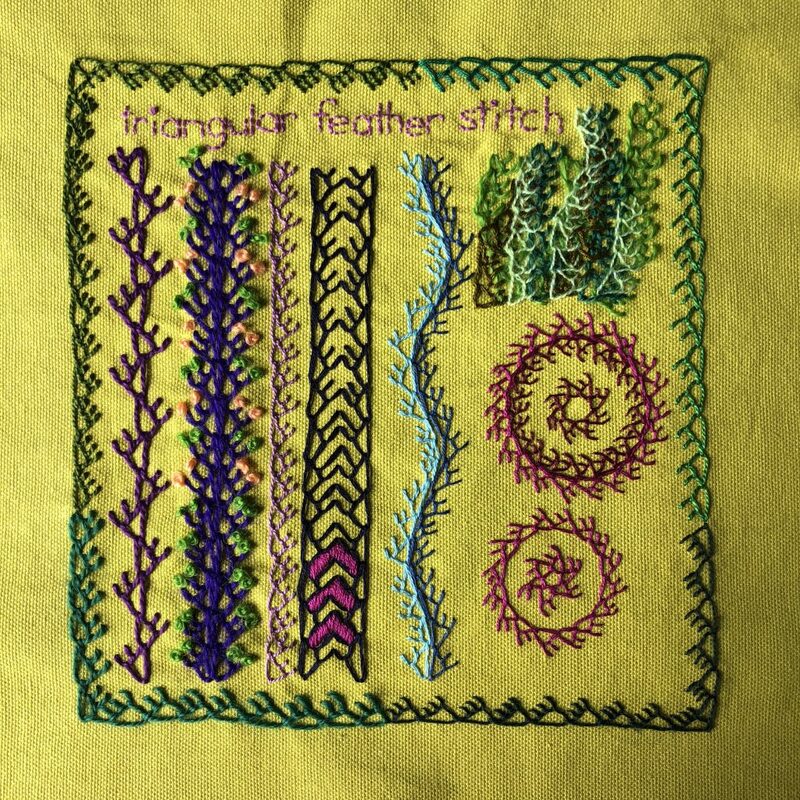 Feathered up and down buttonhole is one of my absolute favourite stitches. I HAD to use it as cactus prickles as it’s such a perfect match! I also tried it with chain stitch leaves and French knot flower buds and layered with a range of different threads. This is one of my favourite samplers in the series. 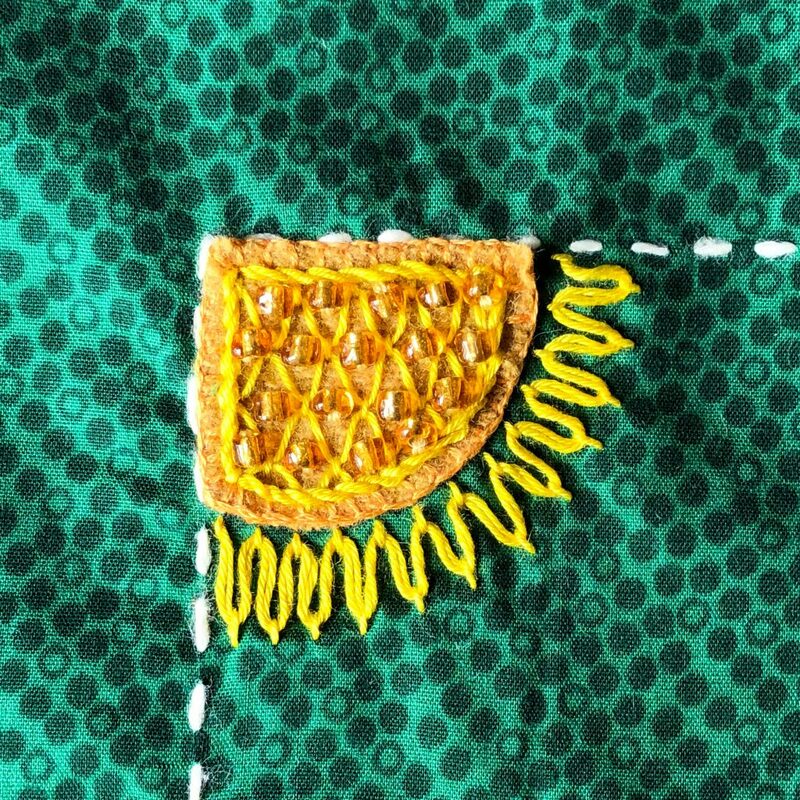 Crested chain stitch is a very graphic stitch that worked well in just about any thread I tried. I especially like the spiral worked in perle cotton, although it need the running to stitch in magenta crewel wool to finish it off. I also added beads to the top of one row, which I like, but it might work better with a thicker thread. At one stage Sharon offered us a challenge to use several stitches in a small project during a few weeks off for people to rest or catch up. 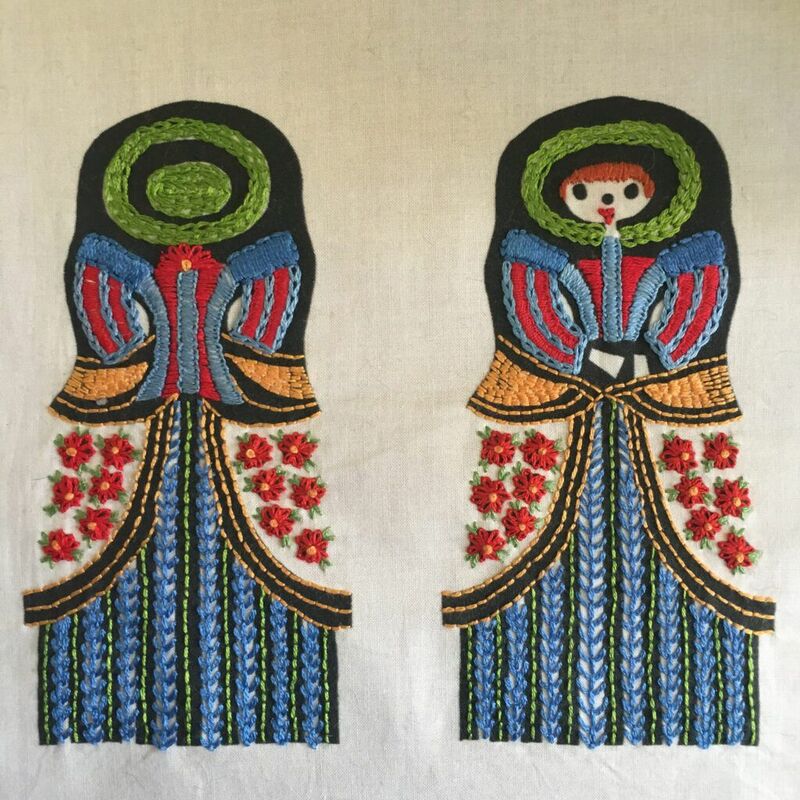 This little doll is from “Embroidery for Schools” by Joan Nicholson. A marvellous book with lots of fun ideas from embroidering on lino prints to stitching on card. I’d recommend it to any stitcher, not just beginners. I still need to add some little beads for buttons on the bodice. I’m thinking of appliquéing her onto the front and back covers of one of my fabric books. Of course, being slightly (ahem) addicted to embroidery, I couldn’t stop at just the TAST stitches! Edging stitch was mentioned in the TAST facebook group. 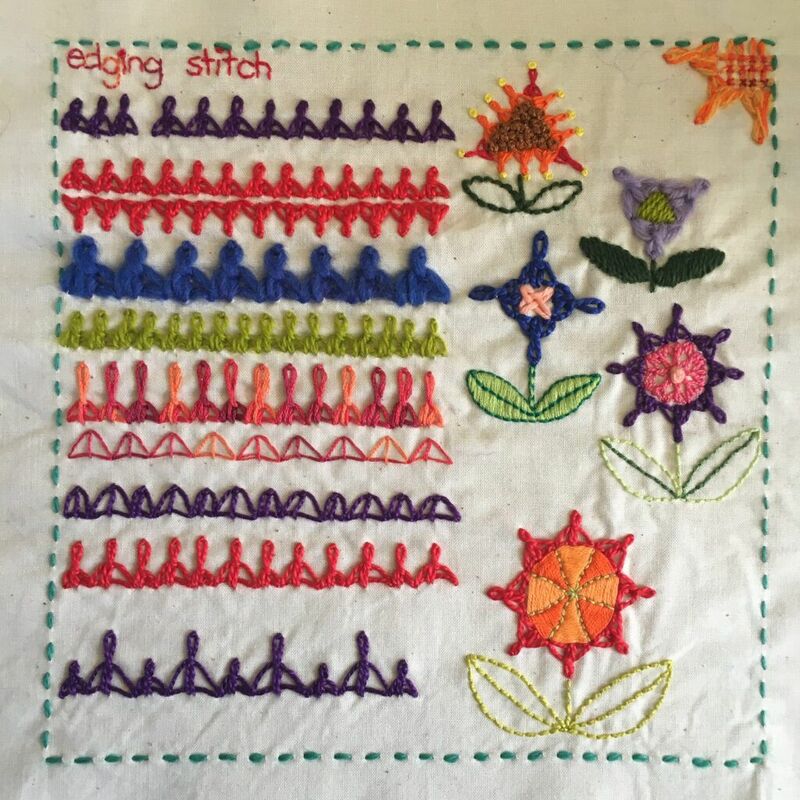 A really pretty stitch popular with embroiderers in India, edging stitch looks best when it’s as tall, or a smidge taller than it is wide. I tried it as flowers, in different heights and without the twisted chain stitch. I saved a load of inspirational bits and bobs to my Pinterest chicken scratch album and stitched out all the ideas I wanted to remember for later. 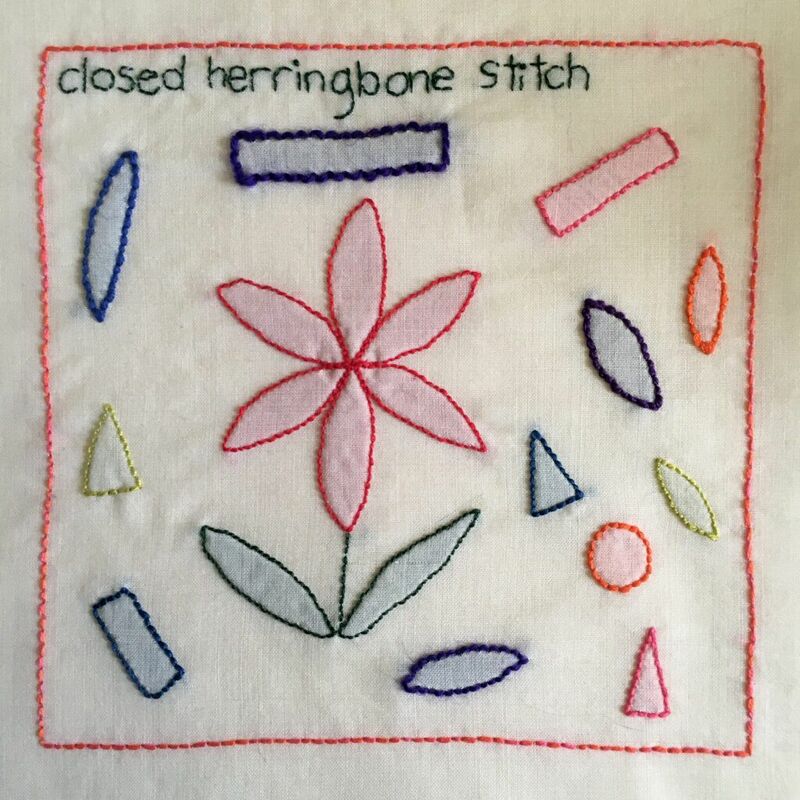 This isn’t the last sampler I made, but I also wanted to record some of the very basic stitches that we didn’t cover at the beginning of the TAST challenge. 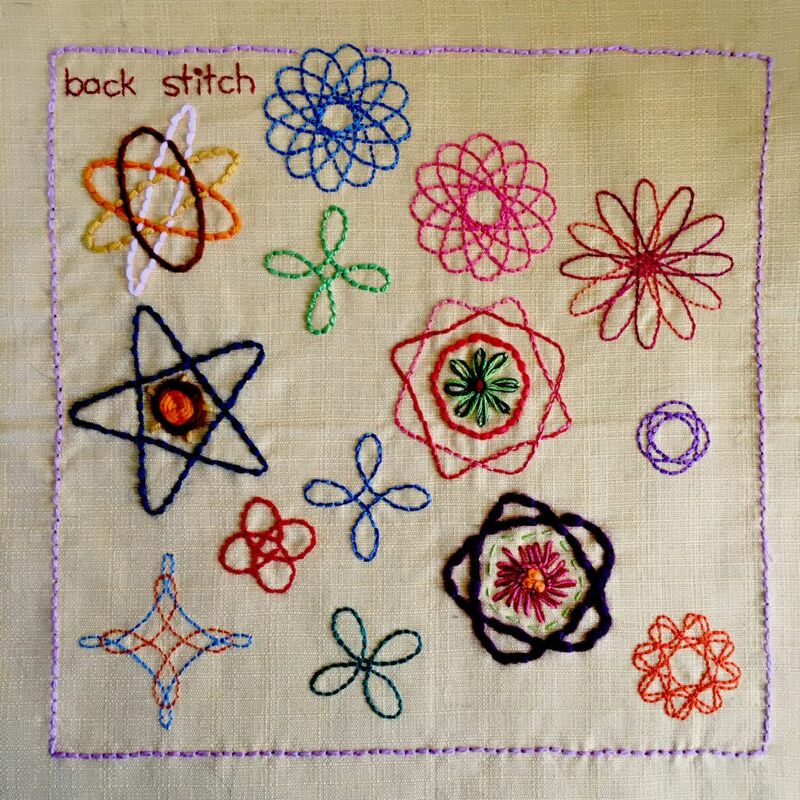 And there’s not much more basic than back stitch. (Except running stitch but I’ve already done a HEAP of those). I also want to do a sampler or two for cross stitch and a few other non-TAST techniques but for now, I’m on to stitch 95! I have been madly stitching away on the Take a Stitch Tuesday embroidery challenge but completely forgot to post about my samplers so I’m going to try and catch up over a couple of posts. Because I like to go back and revisit older stitches, I’ll post the samplers that go together rather than the order I made them. Firstly, I really like running stitch so I worked two more running stitch samplers. I really wanted to try embroidering on net. I drew the designs onto a piece of paper and pinned the fabric onto it. Then worked an even-ish running stitch in what I later found out is sashiko thread. I am absolutely in love with sashiko thread, it’s really smooth and lovely to work with. Done much later, I also worked an overall random plaid design in crewel wools on cotton. I think this sort of overall patterning would make a great background with maybe an appliqué figure placed over the top. 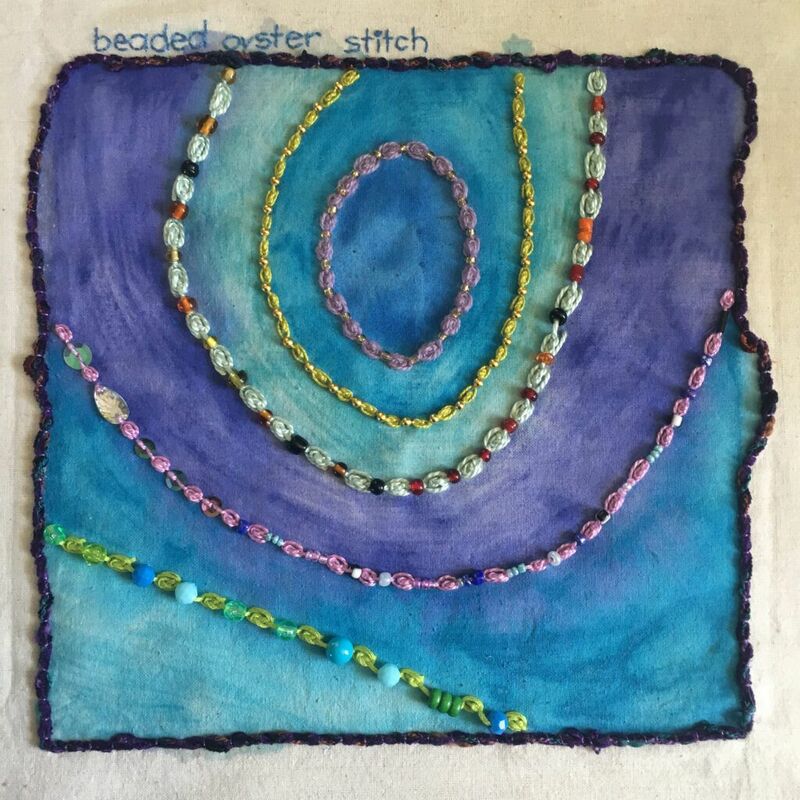 The next stitch is beaded oyster stitch, which I worked on a watercolour background. To make the background I coloured with Caran D’Ache Neocolor II water soluble crayons, then painted over the top with a 50/50 mix of water and textile medium. To my surprise, it didn’t fade at all, even though I thoroughly washed it with detergent. I worked the stitch with lots of different threads, and used couching for the outline. Size 5 perle cotton was definitely my favourite thread for working this stitch, but to be honest, I think it looks good in any thread, as long as it works well with the size beads you choose. My next sampler has three stitches. Breton stitch, which I worked in curves, lines, as a filling and flowers. I varied the look by leaving a space between the tops of the stitches or joining them together. For the blue and orange band, I worked the stitch in navy blue, then laced the top and bottom with variegated orange floss. The filling worked in magenta crewel wool is three rows stacked on top of each other. Worked with a bit more care than I did here, it also makes lovely flowers. I only worked a couple of rows of knotted cable chain in soft cotton, size 10 perle cotton and crewel wool. I really love the look of the stitch but found it awkward to work. I’ll probably revisit it with a page of it’s own at a later date. Laced herringbone square is the third stitch on this page. I tried it with different numbers of wraps and different threads. I prefer this stitch worked quite small with only two or three wraps around the centre. I had a lot of fun with buttonholed and alternating buttonholed cabled chain. Again, since I will be making my samplers into fabric reference books, I tried lots of different threads. I think this stitch looks great in ever one of them. Working the stitch in a zig-zag line (the peach line with blue beads) was not very effective, but I left it so I don’t bother trying it again! Buttonholed cable chain loves beads. I even added some made from seeds. I worked two samplers for closed herringbone stitch, showing both sides of the stitch on the right side of the work. 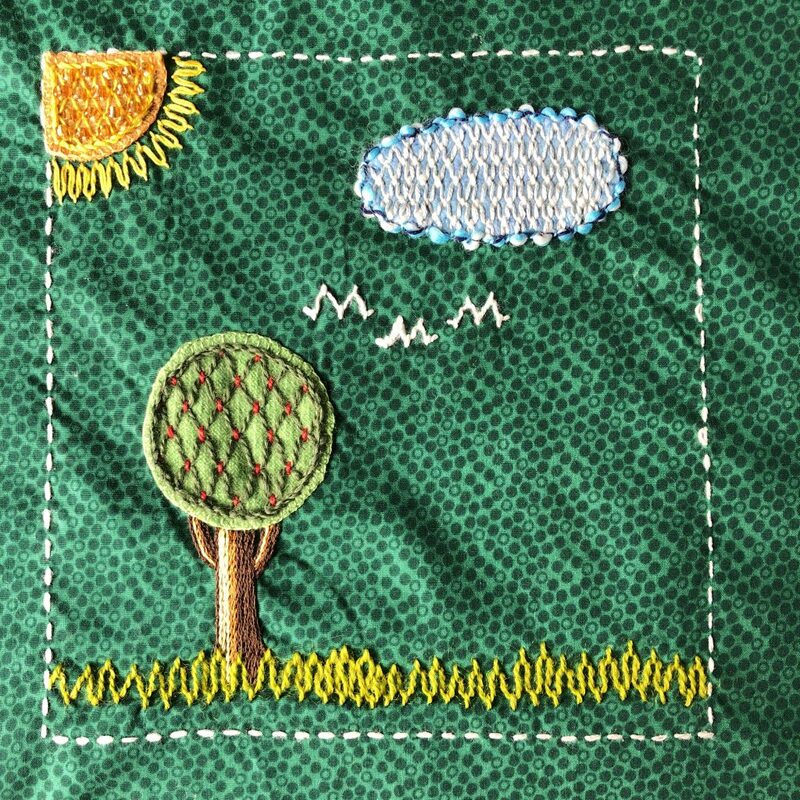 Technically, the shadow work sample is known as double back stitch, but it’s the same stitch, just worked from the other side. First I drew lozenge shapes and worked them in (from the centre out): size 5 perle cotton, soft cotton (needlepoint/tapestry cotton), printed size 8 cotton, crewel wool, embroidery floss and size 5 perle cotton in pale green. For my shadow work sampler I used three strands of cotton floss for the flower and the random shapes are crewel wool, six strands of floss, and perle cottons. 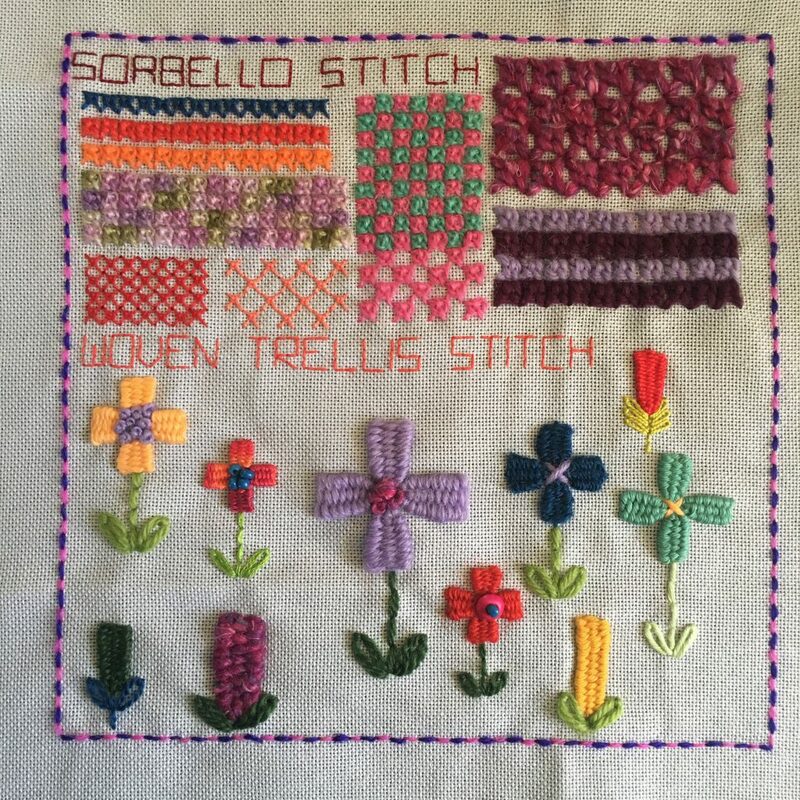 Next is another multi stitch sampler. 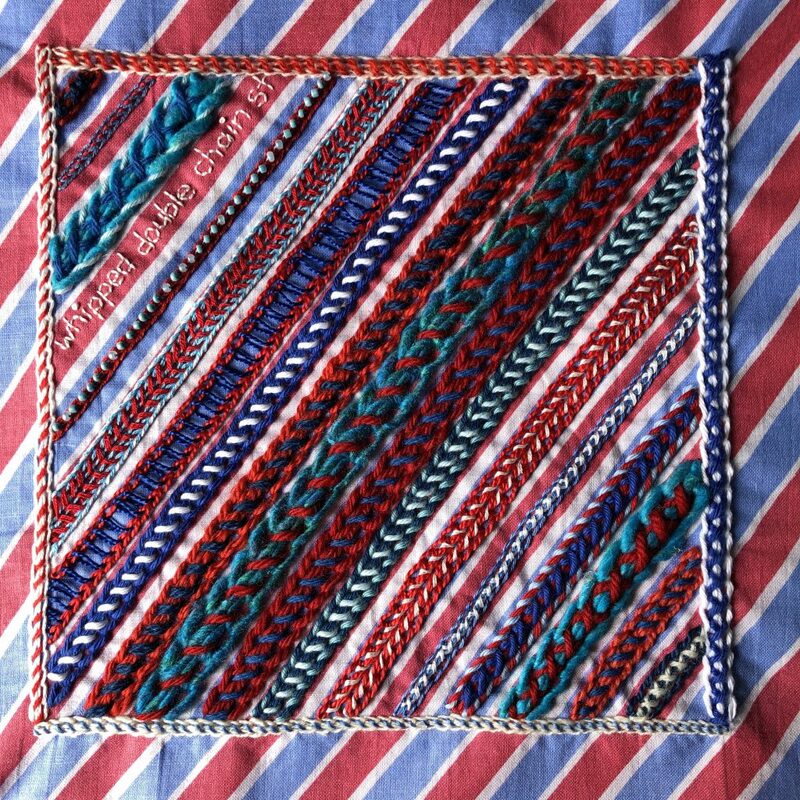 Firstly raised herringbone stitch worked in different threads. I think this is a really pretty stitch that I’ll use again. It makes lovely bands, and if worked in a fine thread, a really interesting filling stitch. 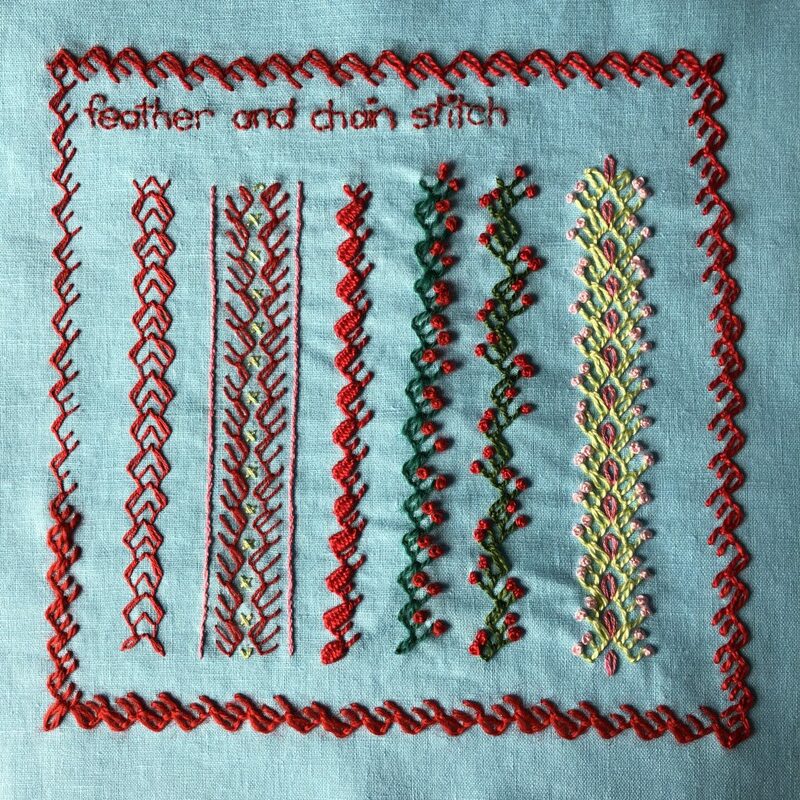 I have worked whipped chain stitch on a few of my chain stitch samplers, so this time I concentrated on trying lots of different threads. 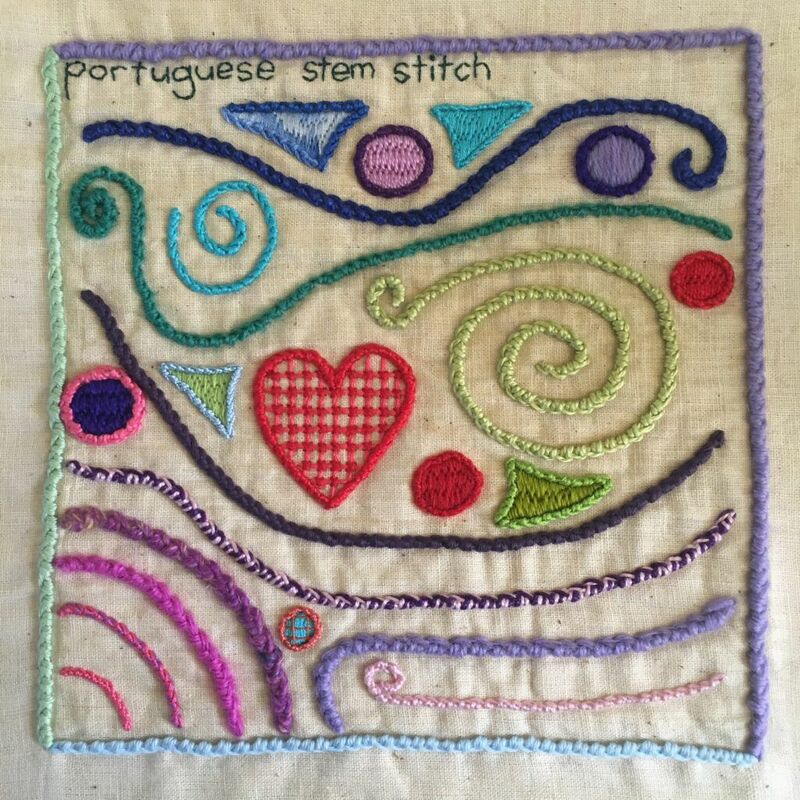 Portuguese stem stitch is a new favourite of mine! Worked in many different smooth threads and I think they all look great. I worked it as straight lines, curved lines and outlines on filled shapes. This stitch has a really lovely depth and texture. 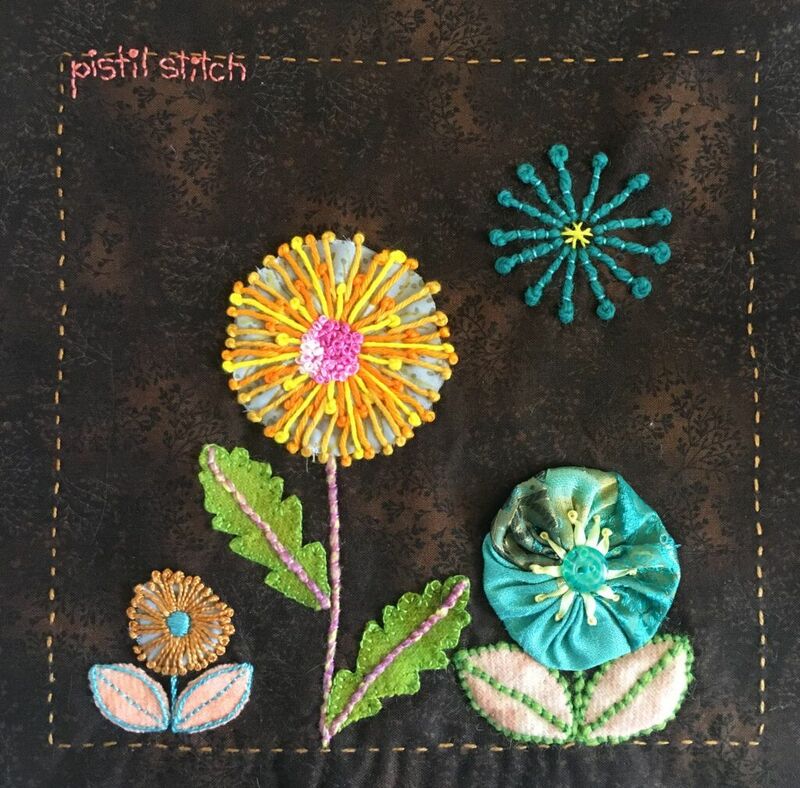 Finally for this post is pistil stitch. I just had to use this stitch to make flowers, but I think my favourite part is the moon, where I couched down the stems. I used soft cotton for the yellow flower, tapestry wool couched with a couple of strands of floss for the moon, silk ribbon for the Suffolk puff flower and size 10 0r 12 perle cotton for the brown flower. Pistil stitch is not a stitch I would ever use on it’s own, it really works best with other stitches. I’ll definitely be using it more, especially the couched version. More to come in part 2, including some non-TAST stitches I couldn’t resist!